This tidy-looking 1978 Unimog U416 is currently on offer at ebay in a no-reserve auction. Besides the 5.7-liter diesel, 20 forward and 8 reverse gears, portal axles, and fully locking diffs, this one features a convertible top, 42″ tires, and front and rear winches. Factory hydraulics are said to have been removed but an onboard air tank for filling up the tires or running shop tools is included. The drop-side bed reveals a six-passenger bench which doubles as a toolbox. The seller makes no mention of high-speed axles, so expect a 55 mph top speed. If driving slowly is your thing though, you’re in luck. This truck is equipped with “super crawler gears” which enable a top speed of 0.06 mph in first gear. One Unimog owner on Bring a Trailer commented that, with proper weights fitted, his former-German Air Force Unimog had a towing capacity of 22 tons. That’s 44,000 pounds! 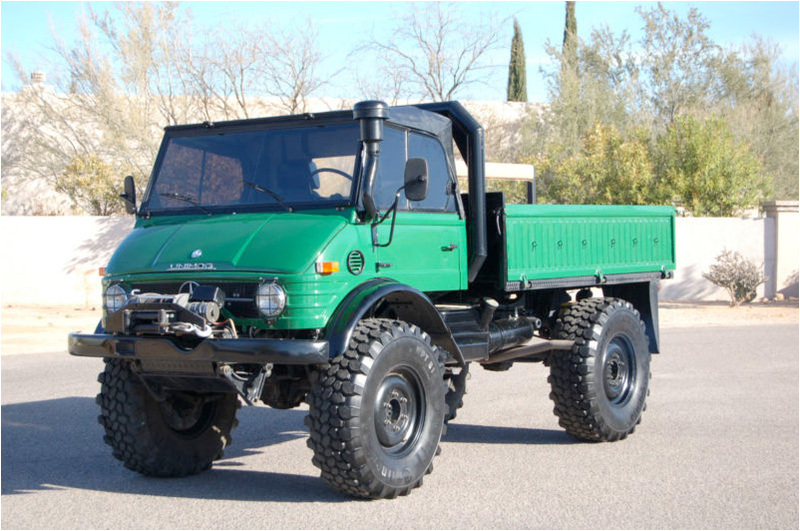 This Unimog is located in Tucson, Arizona. Bidding currently stands at $27,100 with about three days left on the clock. Update 5/6/2013: A day after this post went up all bids were cancelled, which may indicate that the truck was sold offline. The highest bid offered before the cancellation was $28,500.